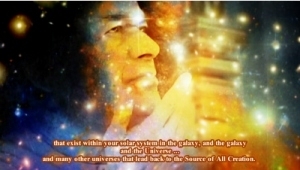 Valerie: It is the 1st of March, 2016, and we are calling upon Cosmic Sai Baba with love and respect and we welcome his presence here with us. It gives me joy to be able to hear you and how you respond to things. Because this is the answer to life and living with peace in your hearts and coping with whatever life puts in front of you. Because sometimes your life’s situations can be quite challenging. And this is what I would just like to talk about today – because there is quite a lot of challenge taking place, around the world, these days. It will not last for too long, but it will continue for some time. There is a new energy coming on to this planet and it is causing disruptions – but at the same time it is lifting the energy upon this planet. Lifting it to a point that has been called ‘an ascended state.’ The whole of the planet will raise in consciousness and that is what is happening. So if you think of your body as having a consciousness – it does. It is separate from your Soul Consciousness which I have spoken of many times. Your body has a consciousness also, it could survive for a very little time after death is approaching. But it will eventually lose, or leave that consciousness when the Soul and Spirit leaves the body. I want you to know and understand that. It is important that you understand that, because sometimes people that are helping those in danger – they think they have died and left their body – but they haven’t quite – so it is important that they stay with the body because there may be a choice to continue in the body and their Spirit/Soul may stay even though the body may be badly damaged. BUT that can heal. The body has an ENORMOUS ability to heal. More than er, I think is readily understood. We have shown the medical world many ways of healing and many ways of assisting people who are sick … but the body itself has a structure of healing that can work very well – it is important not to give up, or to not recognise that within the body. Sometimes, of course, there might be a need to ‘push’ and try to make the body heal quickly – but this is not the body’s way. It actually has a slower mechanism to heal whatever it needs to within the body and it takes a little time. The best way, of course, is a prayer for a particular person that may need healing. Also, if you, yourself are injured or need healing after an operation, or something like this, you can follow your inside intuition and follow that quietly and calmly and thoughts will come from the body that is telling you what it needs to heal. Or sometimes it is just simply a matter of quiet relaxation so that the body can not be busy but, slow down enough to register a healing within it, or to register a consciousness that is within it that believes it is under threat – when it is not really, it is coming from fear – and that can be quietened and the body will heal quicker. But it will heal. So do not give up too quickly if you feel in danger. All you need to do is to quieten the self – quieten your nervous system – quieten your heart – quieten all the bodies within you that function to help clear the body and nourish the body – and then draw upon what medical people advise – and what you feel yourself – what your body is calling out for. I hope that I am giving some advice that makes sense. I am not suggesting that you avoid going to seek help or medical help from a Doctor, or a Nurse or a Hospital. I am not suggesting that you stop doing that. I am just asking, or suggesting, that you quieten yourself and relax. And not allow the brain to race too quickly with all sorts of thoughts and chatter – but go into your heart and listen – because it is where your ‘LIFE FORCE BEATS’ and from that BEAT you will feel what is needed to happen within you, I can assure you. Your Spirit your Soul, will advise you. Some people would call it psychic ability but everybody has it. So do not forget that. Some call it a 6th sense – you can call it that if you like – it is a ‘KNOWING’ that something needs to be done, or to be eaten or to be drunk to help you to heal. Everything in moderation – do not gulp – do not breathe too fast – slow everything down – and it will help the body to heal. So I will leave you with that to think about – I come with my Love, my Blessings, just surrender to Peace. For that is who you really are – Peaceful, Wise Light-beings – if you accept that – your angelic self will keep you safely always. And the God within you of course, it is always with you.